This entry was posted in My Photos and tagged autumn, fall, fall foliage, lake, love, nature photography, photography, pond, reflection, reminder, water. Bookmark the permalink. Oh now that is a rhapsody of color! Absolutely lovely. Better than Notre Dame, better than the Vatican, better than Ste. Chapelle in Paris (and that’s the most beautiful chapel I have ever seen). Wow, high praise indeed! 🙂 The Universe sure knows how to turn it up! Nature beats anything built by Man! Give me Autumn colours anytime! 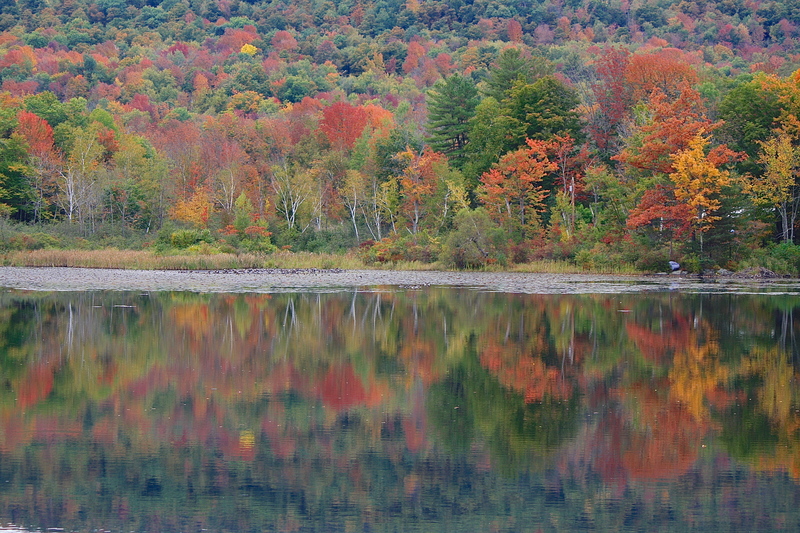 Autumn colors in the Northeast are one of the wonders of nature. Am really enjoying your blog. It makes for a happy moment in my day :). I hope one day you do get to come see New England autumn colors. Start in mid-Sept. in the north and spend a few weeks moving south. You’ll have an amazing experience. This year is turning out to be a good one as the weather leading up to it was cool and dry – perfect conditions! Remind away, Eliza! Such beauty in this world. Amazing picture! We are so lucky to be able to see such beautiful displays of nature! It is true, nature’s beauty is a gift indeed! oh yes!! And why I love the northeast! Beautiful! We still have a green scenery, first leaves are falling. Wow wow wow – so gorgeous! Fall here really is so pretty with all those colors mixed together. Thanks, Fi! WOW!!!! I didn’t know you could watercolor fall that well-amazing!! !